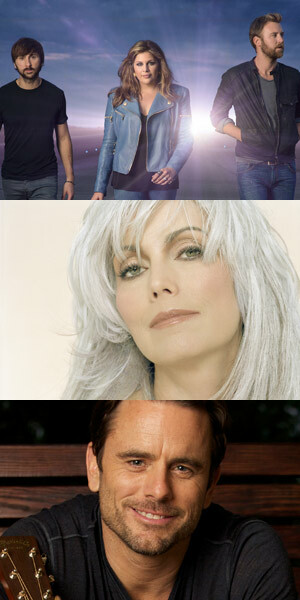 Pictured (Top-Bottom): Lady Antebellum, Emmylou Harris, Chip Esten. The T.J. Martell Foundation has announced Chip Esten will return as host for the 7th Annual Honors Gala, with additional talent including Emmylou Harris and Lady Antebellum. The Omni Hotel will host the March 30 event, and is expected to reveal additional talent in the coming weeks. Previously announced award recipients for the 5:30 p.m. evening include Ken Levitan, Dr. Jeffrey Balser, Billy Ray & Bill Hearn and Becca Stevens. A cocktail reception, silent auction, awards presentation, musical performances and a live auction are all scheduled. Having netted over 2 million dollars for Leukemia, Cancer and AIDS research since 2009, the gala is produced and directed by High Five Productions. Co-chairs for the 2015 event are Ree Buchanan, George Anderson and Danielle Bouharoun. Table sponsorships range from $11,500 to $100,000. Individual tickets are $1,000. Contact Tinti Moffat at the T.J. Martell Foundation at (615) 256-2002. Sponsorships and congratulatory ads may be purchased in the commemorative journal. Email Allyson Baggott at abaggott@tjmartell.org. For more information, visit tjmartell.org.